"...Into the back of the Teeter's Big Blue car seat for a few hours of snoozing before a 7 AM start time..."
I'm not that tall, but I was two feet too long to snooze in the back of that car. I couldn't leave the doors open, because the lights stayed on. I lasted till about midnight until my constant squirming and discomfort made me sit up and say, This is ridiculous; I'll never make it till morning. Endurance is fun. Right? What was better, warmer in the car with no sleep, or cold outside on the ground and a real sleep? It was 36* now out in the desert... but I like it cold. So, I got up, drug my sleeping bags out onto a flat spot on the sand with no cactus nearby. I stretched out in my bags and fell asleep under a bright moon and didn't wake up till my alarm went off at 5:30 AM. There was ice in the water buckets and a little ice on my sleeping bag. Ann had her small trailer - just tiny enough for one human and 2 dogs; but she squeezed me in and fired up her camp stove to boil water for my coffee. Now, I like Starbucks with half and half. This was instant black Sanka or something, and it was some of the best pre-ride coffee I've ever had! Plus those godawful powdered donuts I picked up in desperation at the last gas station (no grocery store for a hundred miles in either direction) were about the best pre-ride breakfast I've ever had. 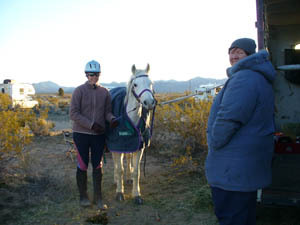 We fed the horses, walked them, huddled around the little heater and our coffee cups in the trailer, then saddled the horses up in a beautiful chilly desert sunrise, and made our way to the start with 99 other endurance riders. 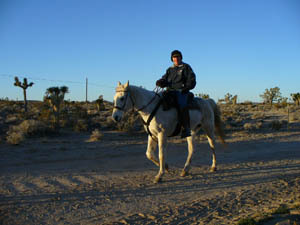 It was great to see again Les Carr and Tulip - now over 19,000 miles for that gelding and still going! That's just incredible. 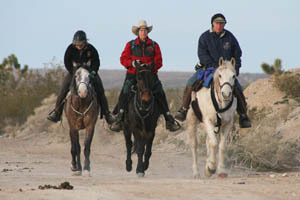 We lagged behind the cluster at the front near The Duck, who was watching people trot on out for the start; my gelding Razzy and Ann's mare Envy were so well behaved and ready to set out across country. Razzy was just great - from the beginning, he was steady and responsive, and he was eager to go, but he didn't pull on me once. 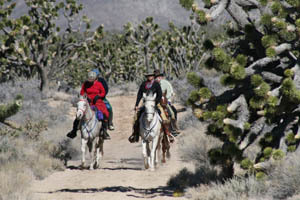 It wasn't too cold or hot and it wasn't windy or rainy - a perfect day to tour 50 miles of the 'barren wastelands' of the Mojave National Preserve on horseback! We made our way up to the foot of the Mescal mountains, paralleling the I-15 - saturated with frantic holiday traffic - then turned south into a thickening Joshua tree forest and cactus gardens - barrel cactus, cholla, yucca, creosote bushes. 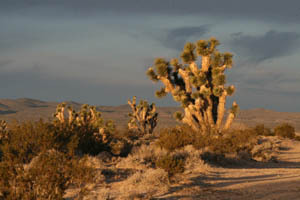 The Joshua tree forest along Cima Road is the largest in the world. There were a few Ravens keeping an eye on our progress throughout the day. It's after about 10 miles - when you haven't ridden for over 2 months - that you start to notice some increasing pains, like your back, inside your right knee, your kneecaps - not knees, but kneecaps - and your feet going to sleep in the stirrups. At 15 miles, you forget the pains and begin thinking of Annie's lunch waiting for you at the lunch stop in another 10 miles or so. 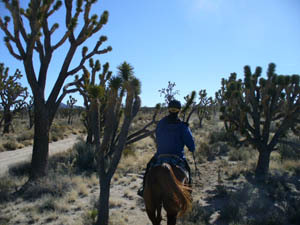 It warmed up as we slowly gained altitude, riding alongside a wash, weaving through the cacti on little cow trails. Razzy had quite a bit of hair, and he slowed down to a walk when he needed to cool down. Ann and I had hooked up with Jackie and Mary, and Frannie from Mississippi, and we headed up onto Cima Dome as a group for lunch. A wind picked up and it got cooler as we climbed; and at lunch, it was cool and breezy enough that the lunch stop was shortened to a half-hour hold. Just enough time to stuff the horses with food, chow down ourselves on a delicious sandwich, and get ready to go back out. Aussie Jay Randle was at the lunch stop, waiting on three of her Aussie riders. "So, what do you think?" I asked her. "Well, it's different! I'm learning a lot!" Australia and the US are probably most similar in the way we do endurance rides... but then a Duck ride is definitely its own unique experience. That's why they are so popular. After lunch, Razzy is even stronger. He wants to go faster, though he still doesn't pull on me at all. Our group loosely stays together, and he hangs back, then lengthens to an extended trot to move out front, then he slows back down. He decides he does NOT like the gray gelding that Frannie is riding, and he keeps trying to turn around to give him a Meany face, though I doubt he would ever kick at him. He just wants to intimidate him with a stare-down. We're headed back to basecamp by the interstate, but it's a long way back... those trucks just don't seem to be getting any bigger! As we try to avoid a deep sandy wash, we zip through the desert on little trails - or on no trails, weaving and leaning and dodging cactus and Joshua trees. 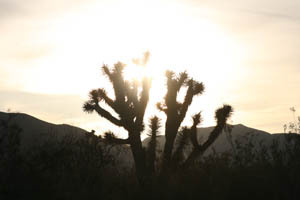 I'm grabbed and stabbed by a few Joshua trees - wicked trees they are! I don't want to rip my tights so I shield them with my arms. 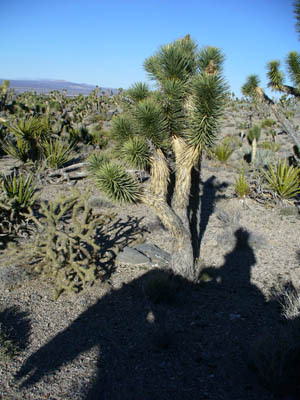 The Joshua trees leave long scrapes, and once I get a hard stab in the shoulder. There's not really anything in the desert you want to grab onto, ever, for any reason. The last 10 miles is like the first 10 miles... I can feel those pains, a lot stronger now. I can't bend forward in the saddle because my back has seized up, and I won't be able to walk at the end of the 50 miles. (But I could keep on riding another 50 miles if I had to!) The pain is worth it, because Razzy has been a blast to ride, and it's a beautiful day out in the desert in this riding club with a hundred other friends. Ann and I dismount to walk in the last half mile, and I almost collapse to the ground. I manage to hobble in, we vet through fine, Razzy gets his 1000 miles, and the Raven is happy because he had a great ride. 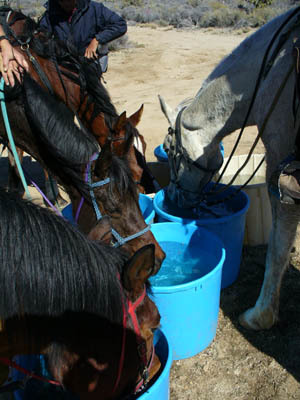 The horses have a good roll and get their legs bandages; we join Shirley and Billy for another good hot dinner, and go to the ride meeting. The Duck actually does call out the names of all the 93 finishers, (from 101 starters) and if you're very quick you can holler out "Woohoo!" after someone's name. Two of the Aussies finish their first American endurance ride. Woohoo for them! Razzy's left front is a little sore this morning - it actually looks like he might've gotten poked by a cactus because there's a little scab in the center of the filling. It's sore to the touch, though I couldn't feel any cactus spines in his legs yesterday. 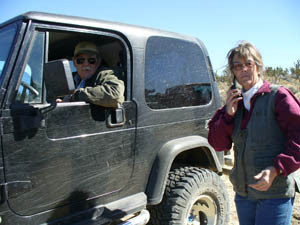 Ann saddles up Envy to ride with Shirley for the 7 AM start, and I volunteer to help pack the trucks and trailers and go to the lunch stop with Dr Q (Bruce W), Kim from Australia, Cheri, and Nancy. The Duck is already out on the trail in his jeep, keeping an eye on riders, turning them the right direction, checking on flagging. Annie is in 15 places at once, directing loading, checking entries and finishers and gathering lunch items and working on making awards (Tshirts, cups and coasters according to each rider's requests), and everything else under the sun. I don't see how she keeps track of everything, but she does, and remembers everybody's names on top of it all. Out at the lunch stop at Cross Rocks off Cima Road, we unload gear bags and food and water buckets, and set up lunch tables... and start making sangas (sandwiches, in Aussie talk) - 120 of them for the 90 or so riders. Ham, turkey, egg salad (I snagged one of those delicious sangas for myself), and tuna, though I miss out on the tuna-making as I go down the trail a ways to take pictures. As lunch is trickling to a close, 3 riders are unaccounted for. One, it is determined, turned back after the start and went back to camp. Two girls, Amber and Frannie, are missing. Robert Ribley had gone back once and found them off trail, and he went back a ways to look again, but didn't see them. Maybe they went back to camp also? Because The Duck came from that direction in his jeep, and he said nobody was back that direction for hours. 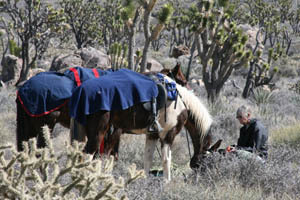 Kalina has been hauled to the lunch stop with a horse to pull ribbons from lunch back to camp after the last rider. After the last horse leaves, we head back to camp and I am able to spend a little time visiting with friends I haven't seen for a long time, and to give Razzy Skittles. He loves Skittles. The bulk of the riders start coming in around 4 PM - a little later today, since it was a 55-mile ride, (and it felt like a 55-mile ride, say many of them). As if putting on a 3-day ride with 100 riders a day is not hard enough to run when things go smoothly, it's now dark, and a handful of riders are missing, including Kalina. The Duck has been out searching; finally 3 of the riders come in, but they know nothing of anybody behind them. Kalina is located. It's 7 PM, dinner is being served, but the ride meeting is postponed. 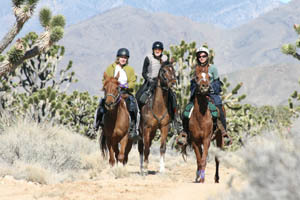 Out in the desert, Kalina comes upon 2 riders, one of whom is Blaine, who has broken her arm out there. 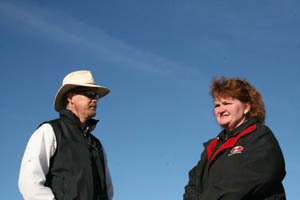 Annie, calm as ever, is planning resuces out with horse trailers and cars even while she's pulling food out of the oven for the dinners. Blaine is eventually brought in and is attended by a number of endurance riders who are either nurses or doctors. She will have to go to a hospital in Las Vegas. Meanwhile, another search is planned for Frannie and Amber, still missing. There's much discussion on where they could possibly be, and the best places to even begin looking. The Duck gives a late, very brief, riding meeting for tomorrow, then discusses with some people on where to head out to search in the dark. He debates about calling out a helicopter. Finally about 10 PM, the two girls make it back to camp, after making it to Cima road, flagging down a car, and one of them catching a ride back to camp to have a trailer come pick up the horses. The girls were in good spirits, just worried about the horses having been out there so long without water and food for a long time. They'd gotten off trail, and then gotten behind Kalina... who had pulled the ribbons in front of them. Bev offered me her horse to ride half an hour before the start... but I was still in my pajamas and wandering around with my camera, bumming coffee (Ann's little stove had run out of fuel), and visiting with people and saying hi's and bye's. I think I was a little wimpy, too - Bev said her horse beat her up yesterday, and I was still a bit sore from the first day. Wah! So I took pictures while the riders headed out into the sunrise, then visited with the Aussies before they headed off to Sin City - Las Vegas. Lela had gotten to ride 2 days on Kat Swigert's horse, and the plan is for her to ride the horse in the 20 Mule Team 100 in a couple of weeks, if all goes well. 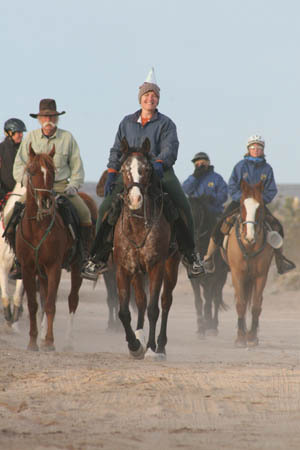 The Aussies enjoyed the EMS ride and the hospitality of the US riders - many offered the Aussies places to stay and horses to ride during their month tour of the US. 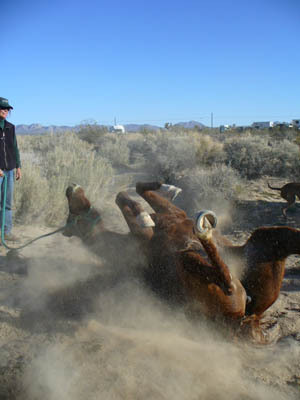 At the Eastern Mojave, many people shared bunks and food and horses with the Aussies; Bruce Burnham not only provided a horse to ride, but gave up the bed in his trailer, while he slept on his dining table. He's planning to return to the 20-Mule Tea ridem, to provide a base for the Aussies to operate from. Jay was overwhelmed with the generosity they'd encountered. 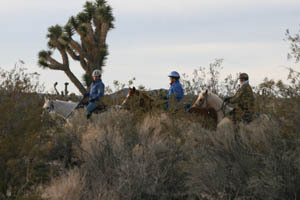 So while the ride didn't turn out quite like I'd planned (3 days of riding), I did get to ride one day on a lovely horse, in the scenic desert with good friends and great weather, I got to visit with people I hadn't seen in a long time, I got to meet some new Aussies, and I left with invitations to visit them. 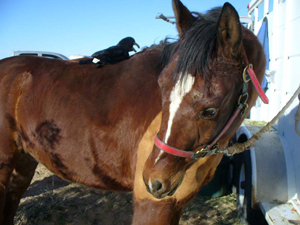 That's what's so great about endurance riding - as I already found out when I went to Australia and other places last year - there's riders like you and me all over the world, who will happily and freely offer you a horse to ride and a roof to sleep under, and you know you'll be able to return the favor along the way.